Is it snowing in Courmayeur ?Thank you! The snow forecast for Courmayeur is: Light rain (total 2.0mm), mostly falling on Fri afternoon. Very mild (max 13°C on Sat afternoon, min 4°C on Fri night). Wind will be generally light. Courmayeur Weather (Next 3 days): The snow forecast for Courmayeur is: Light rain (total 2.0mm), mostly falling on Fri afternoon. Very mild (max 13°C on Sat afternoon, min 4°C on Fri night). Wind will be generally light. 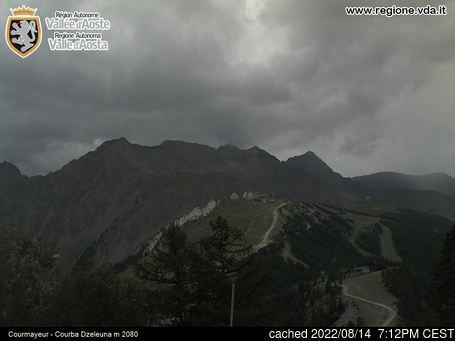 Courmayeur Weather (Days 4-6): Light rain (total 8.0mm), mostly falling on Mon night. Very mild (max 14°C on Wed afternoon, min 5°C on Tue night). Wind will be generally light. Light rain (total 8.0mm), mostly falling on Mon night. Very mild (max 14°C on Wed afternoon, min 5°C on Tue night). Wind will be generally light. Light rain (total 2.0mm), mostly falling on Fri afternoon. Very mild (max 13°C on Sat afternoon, min 4°C on Fri night). Wind will be generally light. The above table gives the weather forecast for Courmayeur at the specific elevation of 1222 m. Our sophisticated weather models allow us to provide snow forecasts for the top, middle and bottom ski stations of Courmayeur. To access the weather forecasts for the other elevations, use the tab navigation above the table. For a wider view of the weather, check out the Weather Map of Italy. Spent a day in Courmayeur after Chamonix. What a difference! Friendly people everywhere, truly exceptional mountain restaurants, great scenery and a wonderful car-free main road. Many places with atmosphere-bars, restaurants etc. Our hotel was perfect: elderly Royal et Golf. Brilliant, location, rooms, service and staff. As for the skiing, it's not for the real top skiers (but they are actually a minority). For beginners and intermediates it is fun in the sun on interesting well laid out slopes which are impeccably groomed. A nice variety with great lifts, minimal lines and a real sense of fun. Lovely resort. Highly recommend it. Spent a day in Courmayeur after Chamonix. What a difference! Friendly people everywhere, truly exceptional mountain restaurants, great scenery and a wonderful car-free main road. Many places with atmosphere-bars, restaurants etc. Our hotel was perfect: elderly Royal et Golf. Brilliant, location, rooms, service and staff. As for the skiing, it's not for the real top skiers (but they are actually a minority). For beginners and intermediates it is fun in the sun on interesting well laid out slopes which are impeccably groomed. A nice variety with great lifts, minimal lines and a real sense of fun. Lovely resort. Highly recommend it. The Courmayeur skiing weather widget below is available to embed on external websites free of charge. 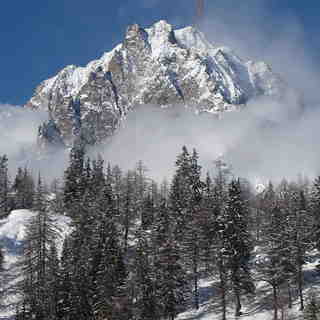 It provides a daily summary of our Courmayeur snow forecast and current weather conditions. Simply go to the feed configuration page and follow the 3 simple steps to grab the custom html code snippet and paste it into your own site. You can choose the snow forecast elevation (summit, mid-mountain or bottom lift) and metric/imperial units for the snow forecast feed to suit your own website…. Click here to get the code.